Read complimentary newspapers over free continental breakfast swim in a heated indoor pool and tackle a cardio workout in the gym at the cozy Country Inn & Suites by Carlson Lehighton. The 65 non-smoking rooms at the three-story Country Inn & Suites keep guests connected with free high-speed internet access not to mention Wi-Fi in public areas. Coffeemakers hairdryers free newspaper delivery and cable TVs with premium channels keep other daily amenities at hand. Adding to the appeal dry bars microwaves and mini-fridges are in all accommodations. Wake to complimentary continental breakfast including waffles pastries cereal fresh fruit coffee and tea. 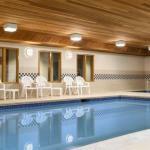 Go for a swim in the heated indoor pool or melt away stress in the hot tub. Burn calories over a cardio workout in the gym. There's also a business center with fax service and photocopying. Baggage hold and express check-out are available. Pack lighter since there's a laundry facility. Meeting facilities are located on-site. Parking is free. Country Inn & Suites is located in Lehighton in the Pocono Mountains right off of I-476. It's less than one mile from Phifer Ice Dam where free summer concerts are held. Go swimming or meander the trails at Beltzville Lake State Park a three-mile drive away. For a unique way to see sights board Lehigh Gorge Scenic Railway five miles away. The hotel is about 18 miles from Lehigh Valley International Airport.